Norder Supply Inc. Spend Money to Save Money? You are aware of the old adage “you need to spend money to make money”; do you also sometimes need to “spend money to save money”? I am suggesting farmers to continue to invest in agronomic principle and actionable insights, even in tough economic times. These services will save you money, and proven to maximize your net return per acre. Soil Sampling. Fertilizer is often an expense that growers look to cut back. How does one know when and where you can cut fertilizer back without first knowing where soil test levels are to start? Simply reducing your application rate, or cutting fertilizer out completely is not sustainable long term. Eventually you will have to replace nutrients you have removed from the field, and often at a higher cost per acre later on. For mobile nutrients like nitrogen, a soil test is even more important. If you find high level of residual nitrogen in your soil test, you can comfortably cut back your application rate, saving you money up front. If you are low on residual nitrogen, you can apply additional nitrogen pre-plant or sidedress, and not wait until deficiency shows up to react and sacrifice yield. Variable Rate Application. Crops usually have a positive response to flat rate applications when soil test values are low. As you build your soil test levels, crop response decreases. This is where you save money with variable rate application. There is no need to apply additional fertilizer when soil test values exceed an optimum level. However, only with grid sampling can you accurately isolate regions of the field that exceed optimum soil test levels apart from areas that still require additional fertilizer to achieve optimum yield. Digital Record Keeping. Having easy access to all your data is key in delivering actionable insights. There are many platforms available to retrieve and display your farming records. 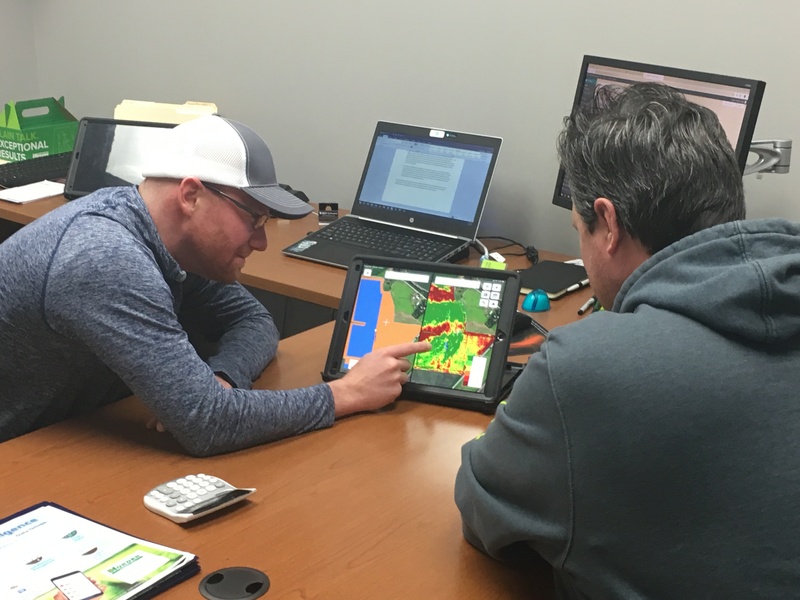 You need a platform that incorporates as much of your operational data and soil test data as possible. Platforms that are non-equipment brand specific provide more flexibility in collecting data. Do your research and find out what platforms your agronomic advisors favor. You need to have easy data flow between all decision influencers on the farm, and these advisors are often your technical support. Soil Moisture Monitoring Technology. If you farm with irrigation, you need to be monitoring your soil moisture levels. Wasteful irrigation can be a significant detriment to yield. Too much irrigation can leach crop nutrients past the crop root zone, and too little irrigation will not let your crop utilize applied nutrients. Knowing you can delay irrigation a day or two for forecasted rain can often lead to saved irrigation events. Moisture probes are still somewhat costly, but still a positive return on investment each year. Your Norder Supply Spot On Scripts team has developed programs that incorporate every one of these services listed. Please visit with your Norder Supply Agronomist for more information on how these and other services we provide assists customers in achieving maximum net return per acre.